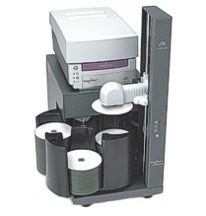 Testa-Rossa are able to offer some of best prices around on CD duplication in Digipak style packaging. The Digipack or digipak is an alternative product to the standard jewel case album and consists of a printed cardboard gatefold packaging with an internal plastic tray to hold the disc. Digipacks have been a very expensive product over the last few years but recently due to higher demand for this product and alternative printers the prices have started to fall. We are now able to offer a run of CD replication in digipak for as little as £799+vat for one thousand units. This new low price makes this packaging option more available to smaller record labels and self financed album releases. As with all our replicated disc products these albums are manufactured to the highest retail quality. This entry was posted on Tuesday, October 27th, 2009 at 12:01 pm	and is filed under CD Duplication Articles.